How Big Discoveries Are Missed – Sometimes By Just Tens Of Meters! Northwest British Columbia’s Eskay Camp has the right geology to produce world class deposits and mines as evidenced by Eskay Creek, Snip, KSM and Brucejack. More big discoveries are really just a matter of when, not if, and multiple drill programs over a broad area this summer will be testing such highly prospective ground that this prolific Camp could suddenly produce some results that immediately command the attention of the entire market. It has happened before and odds are it’ll happen again. 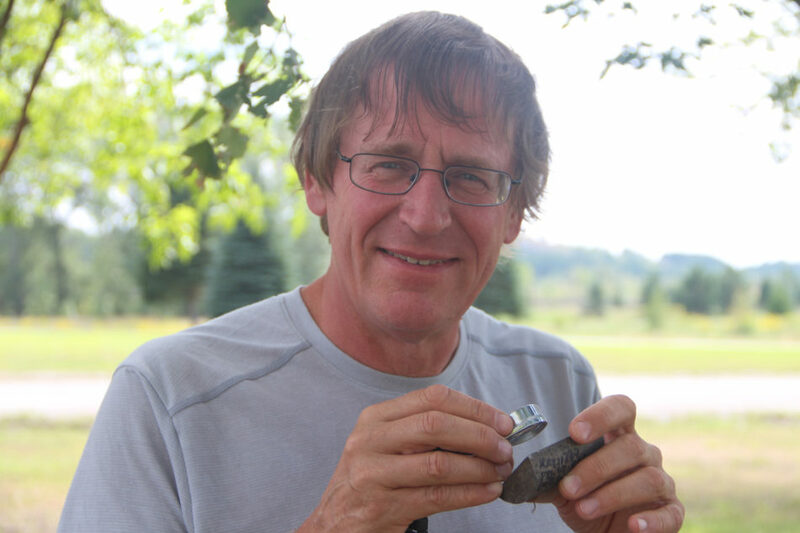 Dr. Peter Lightfoot, now heading up Lightfoot Geoscience after 2 decades with Inco and Vale. Of particular interest, as it could rewrite the geological playbook for the Canadian Cordillera, is the concept of a Nickel-Copper-rich massive sulphide deposit in the heart of this Camp, with potential by-products such as Gold, Platinum, Palladium and Cobalt. Such a possibility has become more than just wishful thinking for a determined group of geologists and geophysicists who have spent many months compiling and reinterpreting historical data from the intriguing 1960’s E&L discovery at Nickel Mountain, just 11 miles southwest of Eskay Creek, and meshing that with fresh data including a recently completed VTEM survey with highly encouraging preliminary results and last summer’s promising surface sampling. The E&L“checklist“ is truly compelling and has caused Dr. Peter Lightfoot – one of the world’s foremost Nickel sulphide experts – to refer to the project as being “in the top quartile of early stage Nickel sulphide prospects in the world.” That says a lot coming from an individual who served as chief geologist responsible for regional and near-mine exploration at Voisey’s Bay, Sudbury and Thompson, and who also wrote the first major textbook on the geology of the ore deposits at Sudbury. 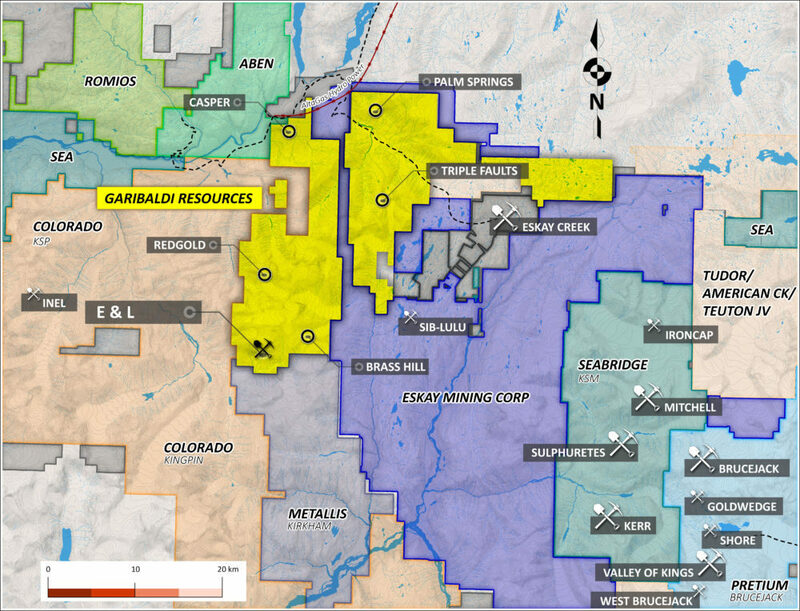 The ground game to attempt to confirm the district’s only Nickel sulphide system as a potential major new deposit has now started for Garibaldi Resources (GGI, TSX-V). 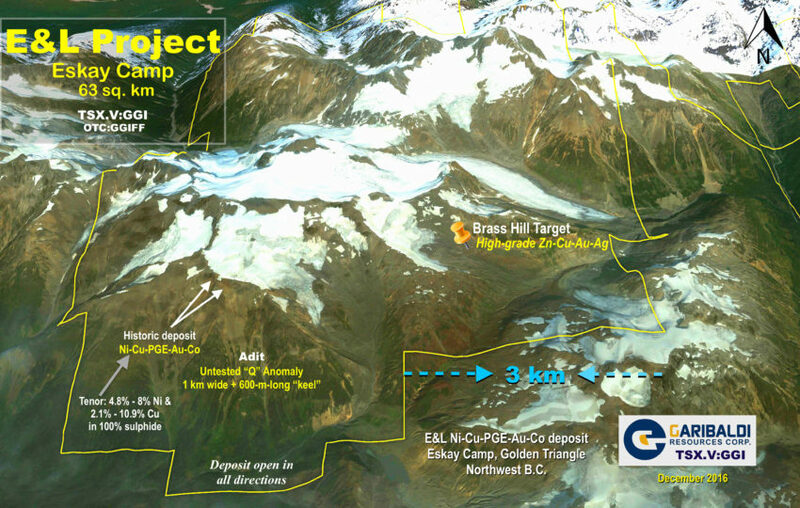 The fact that not a single drill hole has been completed at Nickel Mountain in nearly 50 years, after such encouraging near-surface results in the 1960’s that produced an historic (non-compliant) resource of 3 million tonnes grading 0.80% Nickel and 0.62% Copper, speaks to how even more incredible this district could be if aggressive modern exploration efforts and “outside the box” thinking were applied on a grand scale at under-explored properties throughout the region. That process has started at KSP, Snip, SIB, Treaty Creek (Tudor) and the Iskut Project (Seabridge) in addition to the E&L as you can see on the map, but still has a long way to go. 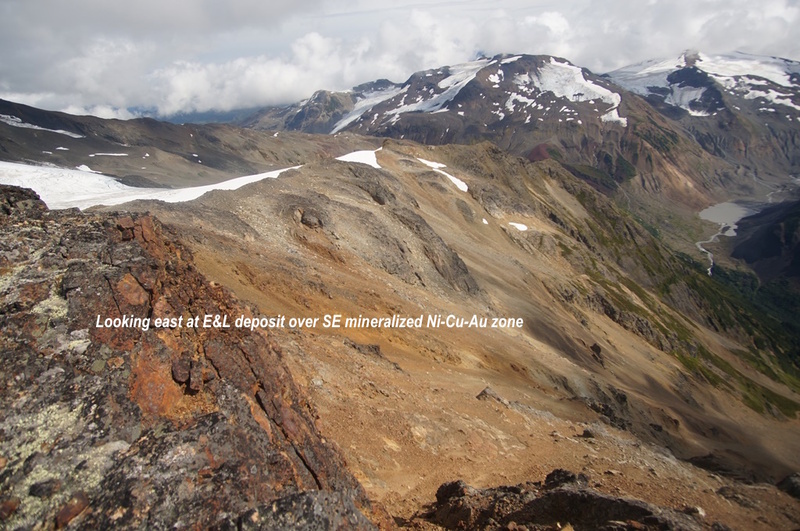 Channel sampling of outcrop at the top of Nickel Mountain last summer by GGI crews returned an 8-m section of massive, semi-massive and disseminated sulphides grading 2.3% Ni, 2.2% Cu, 0.19 g/t Au, 0.32% Pt, 0.39% Pd and 0.10% Co. Meanwhile, sulphur analysis showed high tenor ranging from 4.8% to 8% Ni and 2.1% to 10.9% Cu (tenor is the metal content in 100% sulphide and exceptional levels such as these suggest very good potential for a high quality style of mineralization at the E&L). At this point, in a critical decision that would ultimately sideline the project for decades, explorers decided to drive a 450-m tunnel into Nickel Mountain toward the west, at a depth of 390 m (nearly 1,300 feet) below the surface showings and approximately 550 m due south of those showings in an attempt to intersect the mineralized zones from underground – even though it was still “early stages” and geologists had little understanding yet regarding the geometry of a system that would turn out to be the only Nickel-Copper-rich magmatic massive sulphide system discovered to this day in what is now a proven world class mining Camp. 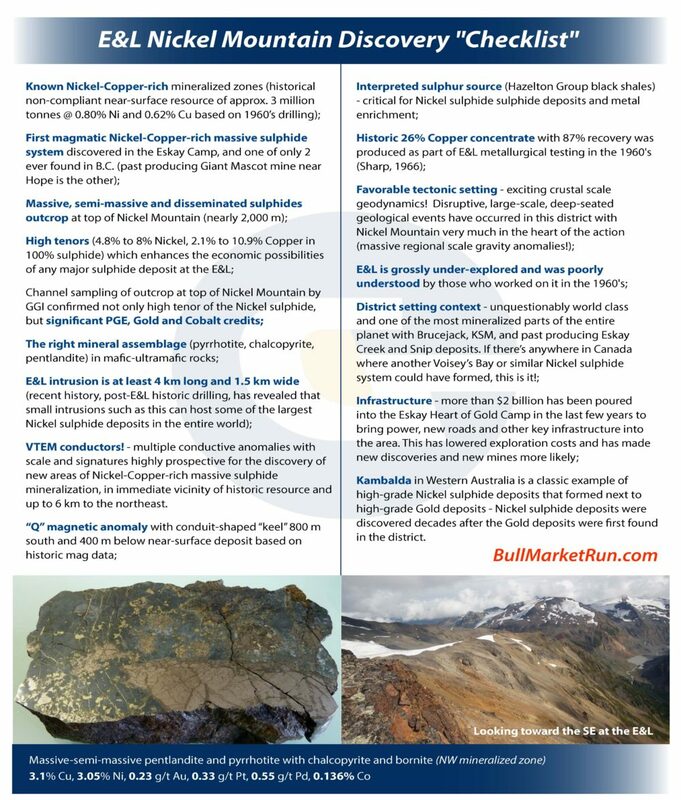 Below is the image released recently by GGI as part of its expanded E&L Nickel Mountain Fact Sheet. Around 1970 Sumitomo was able to complete a series of “blind” drill holes from underground, but new information today makes it hard to understand the strategy behind the direction their holes were drilled. The gabbro host rocks were found to extend down to the adit level but only low-grade mineralization was intersected in Sumitomo’s holes, inferring that pipe-like structures plunged much differently than they had assumed. It’s believed that one of their drill holes actually went right through the side of the mountain into the crisp air! Amazingly, Sumitomo never tested to any significant degree the highly prospective target area defined by GGI’s team of Nickel sulphide experts who have had the benefit of hindsight, a new understanding of Nickel sulphide deposits in small intrusions that has developed over the last couple of decades, and a level of geophysics that simply wasn’t available in the 1960’s. VTEM data are obviously very encouraging regarding this area and suggests that tonnage has the potential to build dramatically while grades could increase as well if a strong conductor is related to massive sulphides. Mistakes made in underground drilling in 1970, hard to fathom today but understandable in an historical context, led to disappointing results after the early excitement from surface and killed the E&L Project at that time, especially with Sumitomo needing to write a check in the many millions of dollars as part of its option deal. The false assumption that the E&L could be no more than just a very small deposit, with not enough tonnage to ever become a mine, unfortunately evolved into “fact” over the years in the minds of explorers and investors which helps explain why the property was never seriously revisited until just a year ago, immediately after the conclusion of a 5-year resource bear market and at a time when much more has been learned about the prolific but geologically complex Eskay Camp. High-grade Nickel sulphides outcrop at the top of Nickel Mountain with massive sulphides intersected to a depth of 400 feet in 1960’s drilling. This industry is rife with such examples, excellent prospects that people gave up on far too early that eventually were re-evaluated and developed into stunning deposits and robust new mines. With some very good luck, Sumitomo just as easily could have hit something huge half a century ago. They essentially threw some darts from underground and missed as they simply didn’t have a handle on the geometry of the system. Of course, all this activity occurred PRIOR to the huge discoveries made in later years at Eskay Creek, Snip, KSM and the Valley of the Kings. There was limited knowledge of this incredible district in the 1960’s, and so much more has been learned about Nickel sulphide deposits since then as well. The “truth machine” will soon go to work in an effort to prove that the E&L is a much bigger Nickel-Copper-rich sulphide system than originally outlined, perhaps one of world class grade and size considering that nothing in this district is on a small scale. It’s still very early in the game but the ride could be wild, perhaps creating the kind of excitement seen in 1989 when Murray Pezim hit the jackpot at Eskay Creek and the entire Venture exploded out of an early summer slumber. Note: John, Jon and Daniel hold share positions in GGI. BullMarketRun.com (BMR) is reader-funded and we accept no advertising on our site. No fee or compensation was paid to BMR or its personnel for the creation or distribution of this report. Our stock coverage is for informational and entertainment purposes only and must not be viewed or interpreted as “buy”, “sell” or “hold” recommendations. No investment opinion or other advice is being rendered on any stock or company. We strongly recommend that you consult with a qualified investment adviser, one licensed by appropriate regulatory agencies in your legal jurisdiction, and do your own due diligence and research before making any investment decisions. The stocks we cover, by definition, are highly speculative and potentially very volatile. Investors are cautioned that they may lose all or a portion of their investment if they make a purchase or short sale in these speculative stocks. We are not Registered Securities Advisers. Our opinions can only be construed as a solicitation to buy and sell securities when they are subject to the prior approval and endorsement of a Registered Securities Adviser operating in accordance with the appropriate regulation in your area of jurisdiction. It should be assumed that BMR personnel, writers and their associates may hold or dispose of or trade in positions in any securities mentioned herein at any time. Owner/Publisher of BullMarketRun.com is Terry Dyer of Powell River, British Columbia. Donald, tenor of the sulphide should have a consistency to it. That’s another reason a tenor analysis is so important. If terms of drill data as it relates to E&L, again, the first big thing will be cut through the heart of the known mineralized zone and reach into the conductor. That will provide an enormous amount of info, including some high grades right off the bat. At 63 sq km, Nickel Mountain will deliver new discovery opportunities for many years to come, even if a Jinchaun or a Voisey’s Bay is found this summer. Since sumitro I and others walked away, is there a risk to the downside as well as upside? Sumitomo outlined the first deposit discovered in the district, Donald – they only missed the BIG deposit that now appears to be there based on a reinterpretation of historic data and fresh info. Eskay Creek was almost given up on, and the huge high-grade deposit at Brucejack was missed on the first try as well. 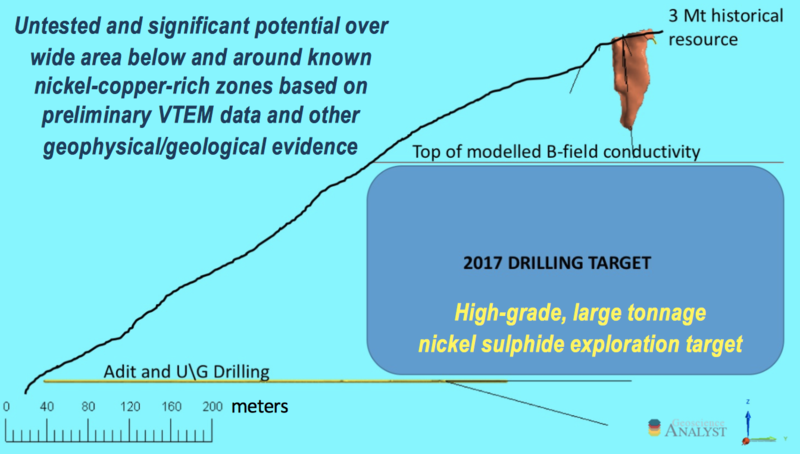 At 63 sq km, Nickel Mountain will be explored aggressively for new discoveries for years to come, no matter if the Big One is found this summer or not. Jon, I am sure GGI has more details on the location and geometry of the newly found conductor near the historic known deposit at E&L. I am thinking they know and also know where Sumitomo drilled from the underground adit and what direction? If they do, then it stands to reason they must be extremely confident that the drill will encounter massive sulfides on the first drill hole after it goes deeper than the historic holes. The interesting fact that I find very intriguing is the 1 meter of visible massive sulfides at the end of one of the historic drill holes that wasn’t followed up on. The question is will GGI release more details this week? Also Jon you also mentioned the ground game has started. Does that mean there are crews on the ground at E&L? Sumitomo even drilled horizontal, Dan1, toward the west – they missed virtually the entire target area outlined by GGI on its diagram in E&L presentation which includes conductor response. Final VTEM results will provide further detail; first crews are there as program starts. Cobalt at a new high, above $27 now. Not really, Jeremy: It was looking more apparent in recent sessions that Gold needed to go lower, made even more clear with our Gold chart in Canadian dollars yesterday. Great action to get positioned for the next wave up in Gold stocks; sometimes to go higher u need to go lower first. Looking for more negativity to set in like we saw in Oil recently, hopefully CNN will declare Gold to be in a new bear market! With July 4th holiday and US markets closed tomorrow, suspect GGI will not release anything until at least Wednesday. Being a contrarian is the only way to survive and thrive in the Gold market and resource sector in general, Jeremy. I get excited when things go on sale and negativity reigns, as that’s how money is made. Just the opposite when everyone’s on the buy side. Oil market was getting thrashed last month and mainstream media was declaring a bear market. Great sign! Best winning streak in 5 years since then. Greenback got temporarily oversold, setting up the current rally and associated weakness in Gold. Predictable. Dollar big picture looks really negative, however, further into the summer. Tremendous buys lining up in Gold sector this month. The similarities to the 2010 market are striking. Sometimes I think it’s all a ploy to scare the crap out of us little guys, then the big boys swoop in like vultures, don’t fall for it…..
A little bright spot, at least nickel hung in there today anyway! Gold – if price hits 1180 – 1150 I’ll be a heavy buyer. At 1150 the inverted W pattern would be completed and that would still be a higher low. Just my 2 cents.